Well, it has been a while since I made any clothing, or really done any real sewing. This vest was inspired by the Peace Arch Weavers Guild 50th Anniversary celebration. To celebrate we decided to have a fashion show. To the loom and sewing machine I ran, and pulled this off in two short weeks. The vest fits very well and I’m sorry I don’t have a photo of me wearing this. I’ll try to get a better photo later. The material is a Swedish Weaving wool, purchased at a previous conference. Sett at 12 epi in a simple dornick twill, I wove 4 yards of fabric. 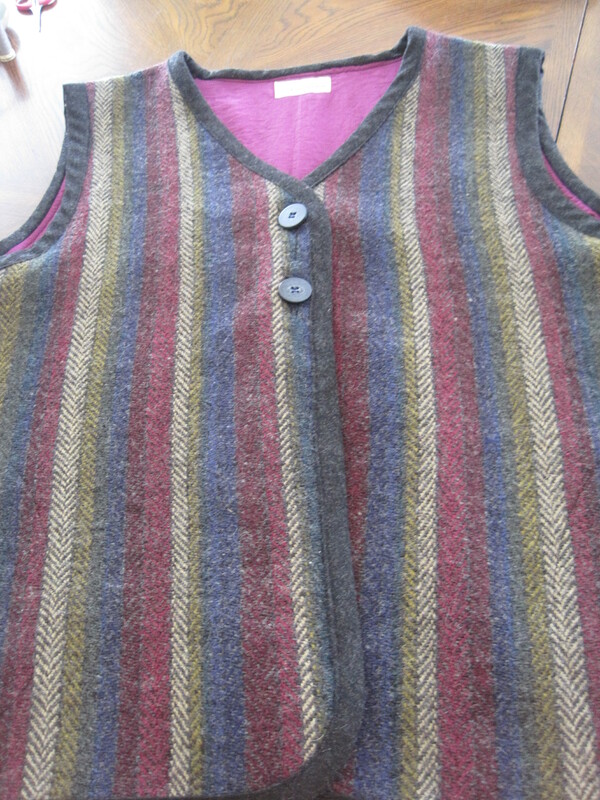 The vest is lined with lightweight cotton lawn, and trimmed with commercial wool. It all came together in two weeks, just in time for the fashion show. The vest will be nice and warm for Fall walks in the park. This entry was posted in Uncategorized, Weaving and tagged hand weaving, Handweaving, handwoven, twill, Wool. Bookmark the permalink. Barb, that vest is so you, I can see you in it. It has amazing fallish colors. Looks great! I like the idea of weaving fabric and making clothing from it but my sewing skills would fall WAY short. Your vest is great looking!